Do you have plans for your Easter Sunday Brunch or Dinner? Why not join the innkeepers at the Prospect Hotel and Dinner House for a day full of good food and good fun? Innkeepers will be serving up their traditional huge Brunch Buffet and the Dinner menu will include all your favorites. There will be an Adult Easter Egg Hunt. Come see what the Easter Bunny left for you! Year after year this has become a favorite event and you might win a Dinner for Two in the Prospect Hotel Dinner House. 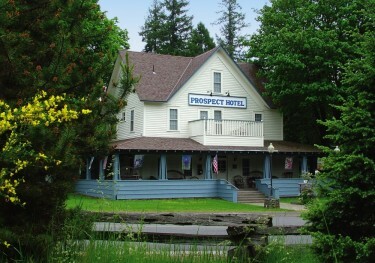 The Prospect Historic Hotel/Motel and Dinner house was built in 1888 as a stagecoach stop halfway between the Rogue Valley and Crater lake. This Nationally Registered Historic Hotel has been restored for full comfort while maintaining its charm. Being the closest Bed and Breakfast to Crater Lake, only 28 miles away, the inn is a perfect home base while exploring Southern Oregon’s National Forests, Wilderness areas and BLM land, and the majestic Lake, of course.